They’re probably more used to being on the receiving end of donations, but kind-hearted hospital staff are now making a difference with a donation of their own. Staff at Hull University Teaching Hospitals NHS Trust approached Fiona Dwyer, of ITV Calendar News and PR consultancy FDPR, to host their annual staff awards ceremony earlier this year and, in return, offered to hold a collection on the night for one of Fiona’s favoured charities. An amazing £700 was donated by those attending the Trust’s Golden Hearts Awards, and Fiona asked for the proceeds to go to the S.A.M.M.I. Fund, a local charity set up in 2015 by North Ferriby-based Sammi Petersen. Sammi was involved in a non-fault road traffic accident last year which left her paralysed from the chest down and requiring the use of a wheelchair. The S.A.M.M.I. Fund now provides both advice and practical support to people with spinal injury. “I met Sammi about 10 months ago when she and her family were setting up her charity. They wanted some help to publicise what they were doing and, because they had heard of me and knew I was local, contacted me. I was so touched by what she’d been through and I was so impressed by her courage and determination not to be beaten by her injuries that the S.A.M.M.I. Fund became the chosen charity for my PR consultancy, FDPR. “Every year, as part of our annual awards celebration, we hold a collection for a charity which is meaningful to us in that particular year. As a thank you to Fiona for giving up her time to join us and host the Golden Hearts that evening, it felt only right that she should choose where the proceeds of our collection went. 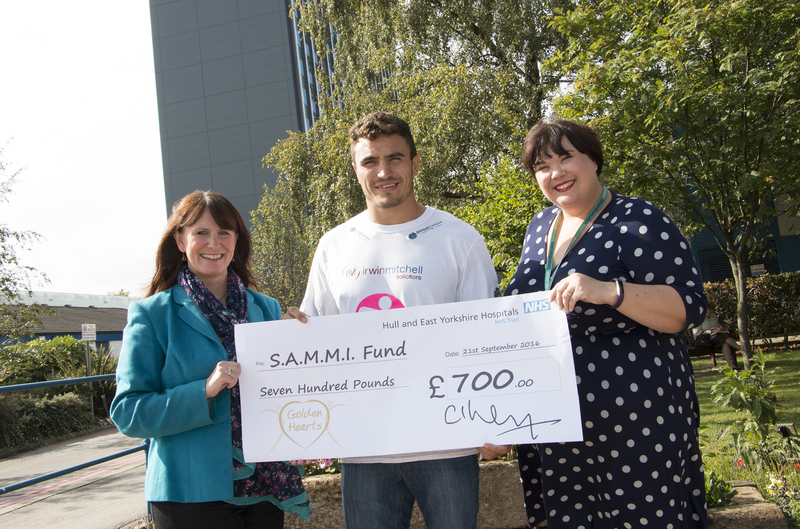 Sadly Sammi was unwell and therefore unable to attend the formal cheque presentation, so Fiona (pictured above, left) and Lucy were joined by Sammi’s brother, rugby player Dave Petersen, at Hull Royal Infirmary for the handover. “Receiving such a huge amount from the Hospitals Trust is amazing. I have been working very hard with the charity to help others in my situation. To be recognised by a health organisation is a huge thing and shows that the charity is becoming known. The support from others is great. I feel privileged and excited about the future. My story began at Hull Royal after my accident and the staff there were amazing and I now thank them for their continued support.